This is the third metro line in the country to be inaugurated by the prime minister this year. PM Modi had earlier dedicated Kochi Metro to the nation in June and Hyderabad Metro in November. New Delhi: Prime Minister Narendra Modi will inaugurate Delhi Metro's Magenta Line connecting Botanical Garden in Noida with Kalkaji Mandir in south Delhi on December 25. The 12.64-km section will significantly reduce travel time between Noida and south Delhi. The section is part of the Botanical Garden (Noida)-Janakpuri West (Delhi) corridor. Prime Minister Modi will also address a public meeting in Noida. As on these earlier occasions, the prime minister will travel on a stretch of the new Delhi Metro line, before arriving at the venue of the public meeting. "The new line represents one more link in the union government's push to modernise urban transport in the country. It represents the drive towards technology-centric, and environment-friendly mass rapid urban transport systems," an official statement stated. Recently, a metro train of the Magenta Line crashed into a wall at Kalindi Kunj depot after it rolled back on a ramp while being taken for washing. There were no casualties, according to the Delhi Metro Rail Corporation or DMRC which had blamed the incident on "human error and negligence" during maintenance. Delhi Metro Rail Corporation had also asserted that it would have no bearing on the launch. Following the incident, the Delhi Metro had suspended four officials, including the in-charge of the Kalindi Kunj depot. 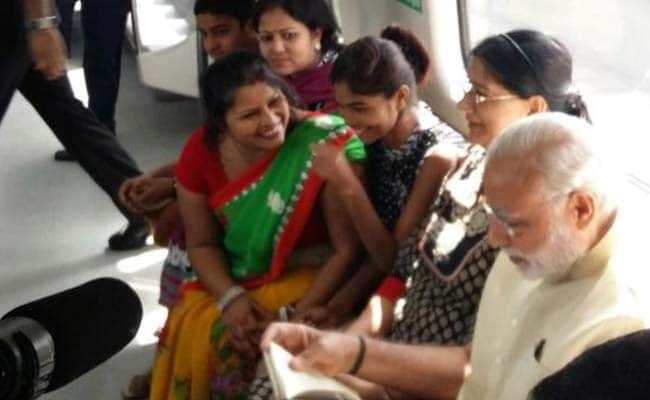 The official statement further said that the prime minister has often used the metro to travel for engagements in the National Capital Region. In January 2016, the prime minister and the then French President Francois Hollande travelled in metro from Delhi to Gurgaon to jointly lay the foundation stone of the headquarters of the International Solar Alliance. More recently, in April 2017, Prime Minister Modi and his Australian counterpart Malcolm Turnbull travelled by metro to the Akshardham Temple. "In keeping with the objective of enhancing connectivity through mass rapid transit systems, the union government has launched nine metro projects covering a stretch of nearly 165 kilometres over the past three-and-a-half years." "Five new metro rail projects covering a total length of over 140 kilometres have been approved. Metro lines of around 250 km length are proposed to be commissioned over the next two years," it added.